Uh oh, guests are heading over and you need a quick and easy cookie that will wow the crowds. May I make a suggestion? SHORTBREAD! This is one of my favorite cookies and its super versitile – drizzle on some chocolate, serve with hot cocoa or coffee, or wrap up a box and give them as a gift (“Thank you for the gift, its so unexpected…I have something for you too!”). Unfortunately, these are freaky-easy to make which really isn’t good in my household. Any baked good that requires minimal effort, time and dishes (in other words, can be whipped up on a whim), isn’t good because I will whip them up on a whim…and eat them all before I know what happened. I got this recipe via an exchange at work – this recipe was a woman’s family recipe brought over from Scotland. Sounds good enough to me! Cream butter and sugar together. Slowly add flour. When dough comes together and you can clean the bowl with it, its ready to be rolled out. Press unto an ungreased cookie sheet as flat as possible. The dough is very short and the edges need to repeatedly be pushed in when pressing out and rolling. Using a rolling pin, roll the dough out to about half an inch thick. To prevent dough from sticking to the rolling pin, you can cover the dough with waxed paper to roll. The shape will be irregular. Using a fork, poke holes throughout the tip of the dough. Cut the uncooked dough into 1″ x 2″ rectangles by scoring vertically and then horizontally. This will prevent the pieces from breaking after being cooked. Place in the oven for anywhere from 30 to 45 minutes. The finished shortbread should not be browned (slightly golden on the bottom is okay). Go over the cuts with a knife after removing from the oven. 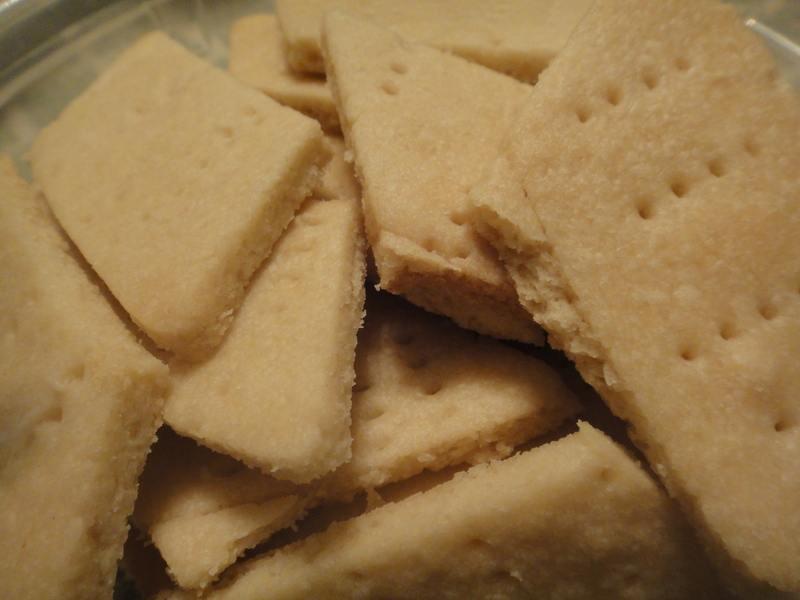 Place shortbread pieces on a cooling rack. I like this suggestion and you’re right cooks up in a flash and is very versatile.